This 3-bedroom, 2-bath gulf-front home is located on Gulf Shore Boulevard, just off of Alligator Drive. This wonderful beach cottage is "just the right distance from the water's edge" -- not too close and not too far. 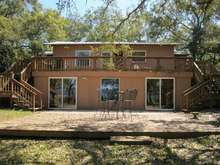 In addition to fabulous gulf breezes, this property's unique location offers guests both sunrises AND sunsets (most of the year). Winter of 2015/2016 brought brand new changes to this already terrific home -- including new flooring throughout, fresh paint, brand new leather living room furniture, new durable dining room furniture, flat screen wall-mounted tvs, an entirely new kitchen including cabinets and granite countertop and stainless steel appliances. Interested in renting adjoining properties? Gulf Breeze is next door to another great rental, All Decked Out. Beds: 2 Queens (1 in each of 2 bedrooms) and 2 twin beds in the 3rd bedroom.